I was so excited to work on a December Daily album for Simple Stories this year. Do you know I have never done a December album before. I think I have mentioned before that mini albums stress me out? The whole designing something on such a small space and making it look organized and consistent while at the same time interesting and beautiful? Too much pressure. But, Simple Stories does A LOT of the work for you. The SN@P albums come in a bunch of cute colors including red and green. I went with green for mine. 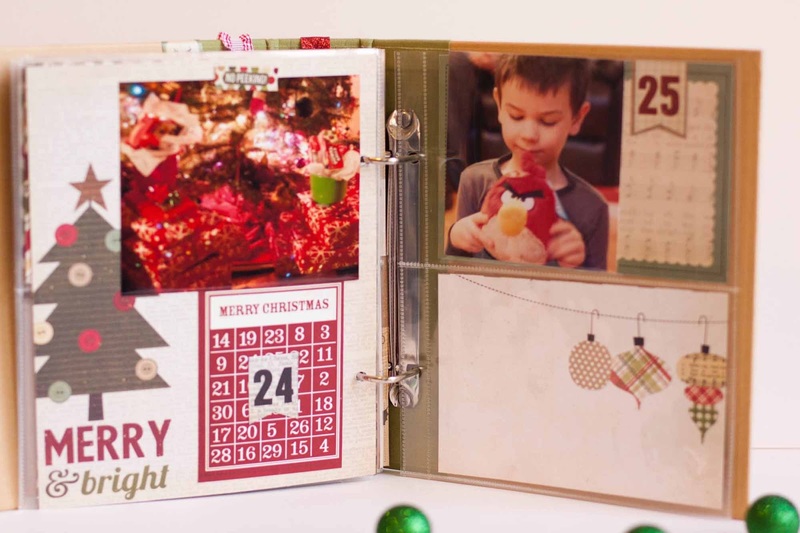 And there are all types of products like full pages, mini cards, larger cards etc in the simply beautiful Handmade Holiday collection. Add to that a variety of page protectors and you have yourself one quick and easy December Daily. I created basic page backdrops and used number banner stickers from Handmade Holiday to mark each day from December 1st to the 25th. On some of the full sized pages I added some pictures from last year, just to get an idea of what it will look like when it is completed. --especially since this year we will have ticket stubs from the Polar Express! I think I am more excited than the kids about this! This is such a quick and easy way to include all the little traditions we try and do each year like the Target gingerbread house. Yes, it is from Target--don't judge, it is after all a tradition! You did a fantastic job with this! Love it! I love your album. I can't wait to start mine....thanks for sharing. This is amazing Rebecca! I love it!! Love all of your ideas you have in here...wonderful job! You did a beautiful job with this album Rebecca. Love your little pockets and how you did the cover and binding! 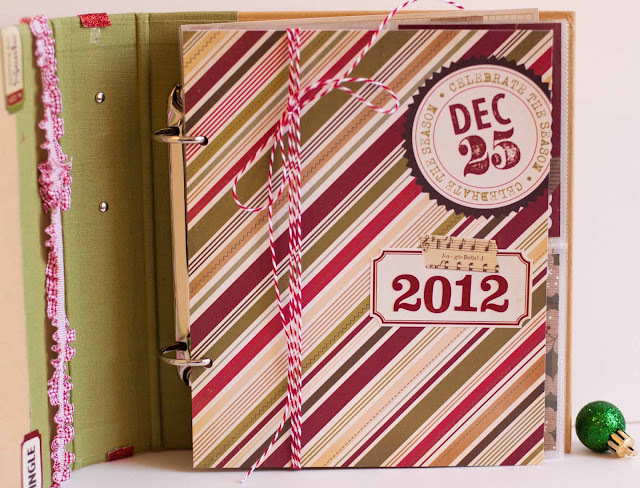 oooh you used cute ribbon and twine too!!! Great work! Love everything about this...so fabulous! love what you did with the spine. Yeay! I love the cover - just awesome! Fabulous cover!!! Love the use of the twine! The cover is just beautiful! So beautiful - love all the details. Love what you've done so far, it's going to be a fantastic album! Sweet album....the details are awesome!!!! Rebecca... your work is always STUNNING! I actually just decided this past TUESDAY that I would do a December Daily AND I bought the Simple Stories album, thinking that it would be perfect for this! I haven't decided what "Christmas line" to use yet, but after seeing so many awesome dailies, think I might have to stick with Simple Stories! you have me very excited to start working on my December album! wow beautiful these papers are amazing. Your album is beautiful - thanks for sharing. LOVE......LOVE......LOVE!! Thanks for the chance to win this beautiful line! Your album is wonderful. I love the way you did the binder. I, too, would love to have this collection. I don't want to create a daily, but I do want to make an album. Thanks for the inspiration. WOW! Your album looks AWESOME! so beautiful! i like the idea. i like the 4x6 photos, and this way is perfect! Cute album. Love the pages! Very cute album....Thanks you for the inspiration. I will be doing my first December Daily this year! I started to pull together supplies and I hope to get my foundation pages done over Thanksgiving weekend. So excited! Lovely! I am so excited to put a DD together this year! Really like the pockets and the glitter ribbon or paper stips! Thanks for sharing! so gorgeous, love your DD! 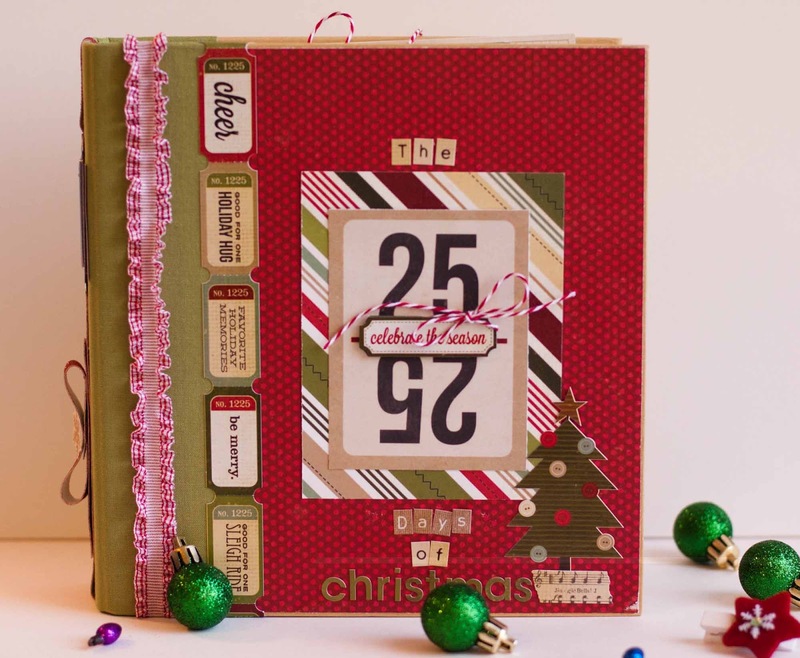 Your December Daily is lovely! thank you for sharing with us! Great album! I am not doing a daily this year (never have) but I sure do think they are a good idea! 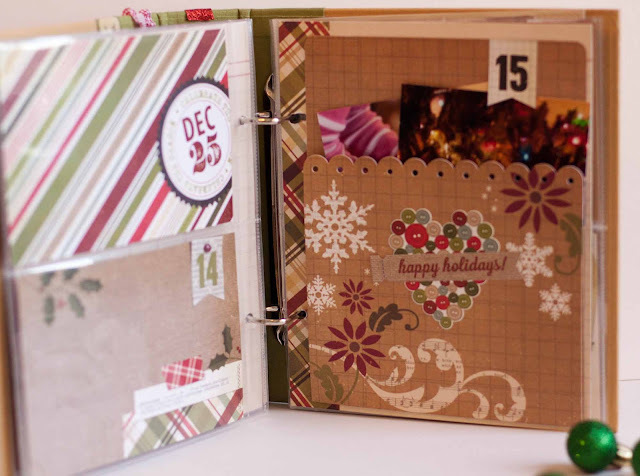 Very cute album & I wish I had the Simple Stories products to do my December Daily! I create my DD base every summer so I am ready to fill it in come the holidays! Maybe I will buy this year's SS for my 2013 DD! What great ideas! I want to do this! Love, love Simple Stories! I love how simple and fun your album is. Thanks for sharing. I don't do a december daily BUT I have done a Christmas Album for the past 13 years--- I just add to it every year! I love your album, especially the colors. Yay red! So glad you decided to do the December Daily album, because it's awesome! And, it's great inspiration for me to actually do mine this year!!! Thank YOU! I love it!! Thanks for the inspiration!! Good idea to use some last year photos just to give an idea on how it looks!! Yes, I do a Dec Daily album but just loving all the inspiration with the Snap albums. What a super cute album! I adore it! Great album! 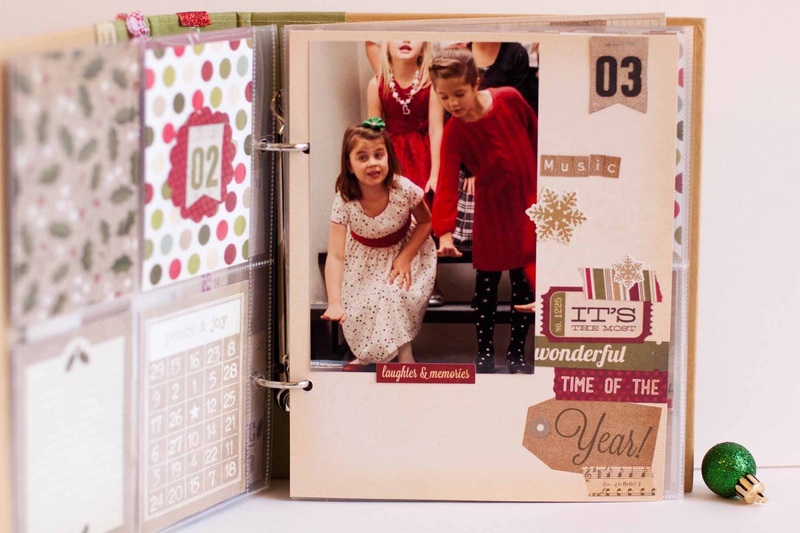 Love these little albums and the variety of pages/inserts they allow! Beautiful Album! So sweet! Love all the little details! Love that you embellished the spine!! Thanks for sharing your great album! I would love to make one for my grandkids! The more I "hop", the more I am loving this product. Love the way you put your album together. I love it! I really like that peppermint striped twine! :) Thanks for sharing! 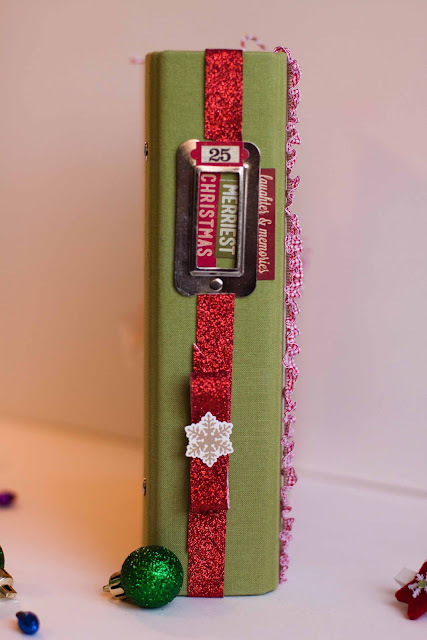 I love your cover with the glitter ribbon on the spine and the red dot paper, peppermint twine etc. Adorable!! like this daily also...need the collection so i can make my own daily! Your album is so cute! Good job getting it done early! Your album is great! I like how you decorated the front and the spine of the album. Loving this collection. A must have! Your whole album is great Rebecca but I just LOVE that ribbon on your cover and I love that one of your traditions is the gingerbread house from Target!! Super cute! Love the ticket border on your cover. TFS! Very cute album! I haven't done a DD...yet. I'm loving all the inspiration on the hop! I love my DD's. (I actually just finished my 2011 edition!) This will be the 4th DD for me. I am sure that using a Sn@p album will help me keep on top of it this year. I love the variety of the page protectors and the cb and paper pages. I have a good start already on my base album and can't wait to add the details! Love your DD. Love how easy snap is making it! 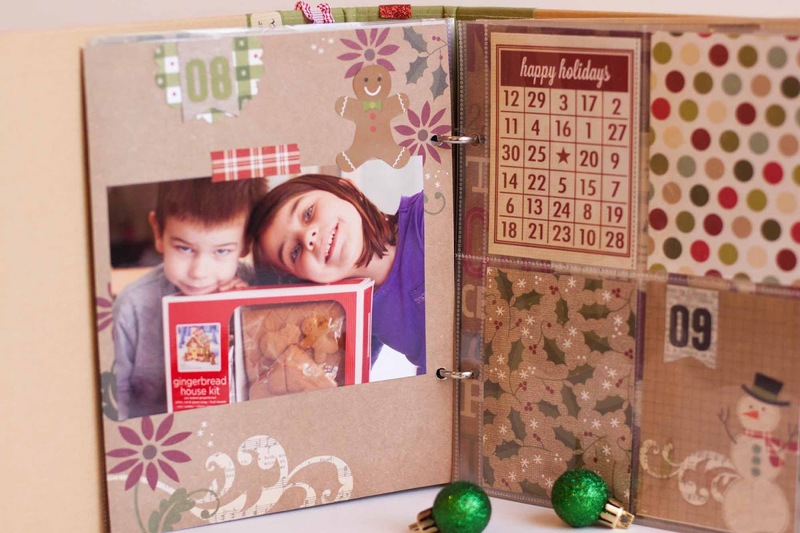 Very cute album - I'm sure it will be beautiful once it's all filled up with your December memories. This is a great keepsake! Love your album! Can't wait to get started on mine! I'm not a fan of mini albums either! But, you gals are sure making me want one! I think I could get into scrapbooking more with this product. If I have the basics I can build on that. Getting the basics to start is my problem. Great job on your album. You'd never know you don't like mini's. You did a great job on your album. I think I'm going to do a DD album this year, thanks for the inspiration. Collecting ideas and I thank you for your inspiration. Absolutely beautiful . I like the addition of pockets here and there . They make a great spot for extras . TFS . And no , I have not done a December Daily . My kids are grown up . Maybe I will do one for all of my x- mas pics . There are tons . OMG, this is the best blog hop I have seen all year. I have created my very first DD this year and I am so looking forward to start adding pics and journalling! Great December Daily! You did a great job! Sweet album! Love the ribbon details! Oh my gosh, I love this album!! I can't wait to make my first Sn@p Album!! such great ideas to get me started on my December daily!!! I love the Gingham Gathered Ribbon you used on the album cover! Lovely idea. So many great ideas. Love all your ideas. Thanks for sharing. So stinkin cute! Love the reds! Precious! Love seeing this with photos of your CUTE kiddos! Great job! Love the cover page! I'm doing December Daily too and with a Sn@p album to boot. :) Love your take! And thanks for the chance to win! I was also loving the twine. Here's to some twine love!! Last year was my first Dec. Daily but I loved it and can't wait to get started this year. I have to say I haven't seen a Dec. Daily album that I didn't like. 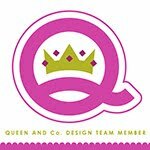 Great blog hop. I loved the way you built up the pages and using last year's pics was brillint, now you can see how it will all look! Cool album! Thanks for sharing! I love your cover design. Lots of detail! Thanks for the chance to win! Love your happy and lovely album! Thank you for sharing. I have not done a Dec. Daily before but plan to do one this year! Thanks for sharing your beautiful album ! Thanks for sharing. I love the little tickets. I LOVE your cover!!!! I am doing DD this year. I wish I had know about Simple stories album before I made my album (at a retreat in July)...but I am so excited to use some of the products...page protectors and papers! thanks for all the inspiration, cute cover and spine! What a wonderful album you have used to document December Daily. love your album cover and pages! Thanks for sharing! Great Christmas Album. Love the smiles. What a great job. Love the ribbon and twine details. oh I love your take on this! It is so creative!! 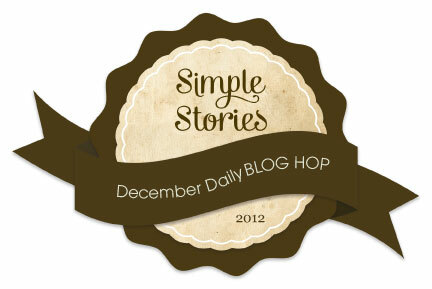 The more blogs I read during this blog post, the more I NEED to do this December Daily album Simple Stories style! It's all I'm going to think about! Your album is awesome...love the snowflake reminder!! I love how you mixed up the kinds of pages in this. I have attempted DD's in the past, but have only managed to finish one, a year and 1/2 later :) The Sn@p system & Handmade Holiday collection are the answer to my poor DD prayers! Thanks for the inspiration! Wonderful! Your cover and binding edge are fantastic! I wasn't a follower before, but I am following through iGoogle now. TFS! I love the binding! I am inspired, your album is adorable! Gorgeous album. Like it so much. I liked your use of ribbon and twine; bonus was your extra pockets! I really like all the bright red. Thanks for your inspiration. This year I'm going to make my first december daily. Looks beautiful! Really looking forward to making a December Daily of my own! Mini albums scare me too, but those snap products are making me re-think! Our gingerbread house is from Walmart...my daughter loves this tradition. Great mini...very prettty! Beautiful album. I'm getting lots of inspiration on this blog hop. Thanks for sharing with us. Your album looks awesome, thank you for the inspiration you've passed on to me. Happy Holidays to you and yours. Thanks for the inspiration. 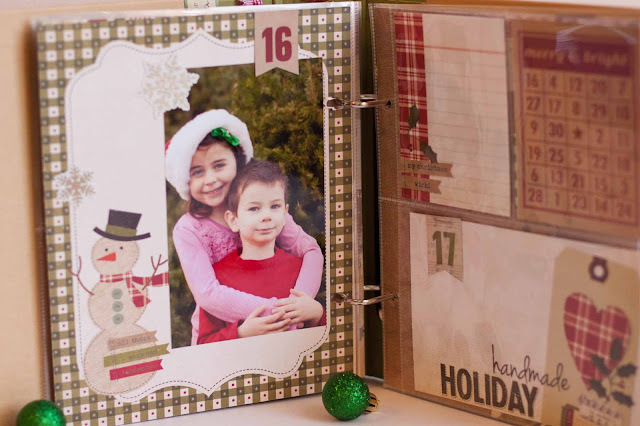 I love the Handmade Holiday collection from Simple Stories and the sn@p collection makes it so easy to save all those Christmas memories! Very lovely album --- filled with lots of ideas. Thank you! Val from IL. Thanks for sharing your project Rebecca, it's beautiful! What an amazing keepsake that will be... I have done (attempted) a December Daily in years past but found it to be really overwhelming, to the point that it didn't get finished, sad I know. 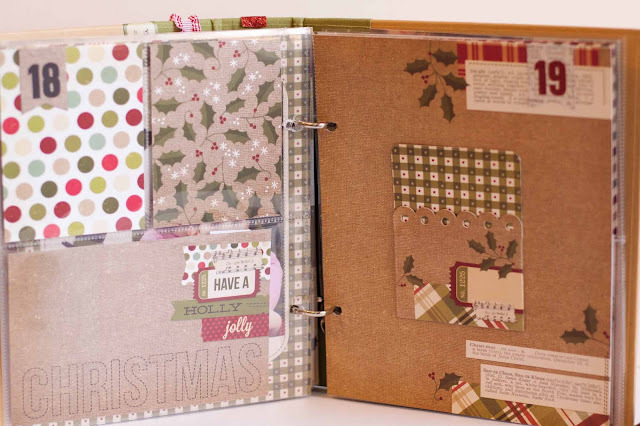 But I am super excited about doing it this year using Handmade Holiday. Using SS makes it "simple" but without taking the fun or the creativity out of it. It doesn't get any better than that does it?! Fabulous DD album and love all the sparkle! What a cute album! It will be such a treasure to have years from now to go back and look at. I haven't done a December Daily before, but will do something this year thanks to all this inspiration and the easy of Sn@p! Yes, I am doing a December Daily this year. :) Love your album!!! And I am a new follower. Glad to find you! I love what you have done, so many ideas in my head now from this blog hop. And I now follow your blog, love your style so I'm happy to find you. I love you album, so many great ideas!! Thanks for all the great inspiration. I like the added pockets. I always forget about the memoriabilia that I'll want to add and making the pockets before hand will be a great reminder. I usually scan and resize items to fit. I love it! It makes me want to go work on my album. I love how you embellished the spine, it looks great! (typing on my ipad was no success so I'm behind my computer now :). Just wanted to tell you that I realy love your mini! I've made 2 December Daily's sofar and every time I look through them I'm so happy I made them. So this year I'll be making one again.... I wasn't planning on using SS but seeing your album makes me want to reconsider. Love everything about it! Looks like your album is off to a beautiful start! What a great album! Love the label holder on the spine of the album. Have fun at the Polar Express, my kids loved it!! Can you say, "adorable"? So cute. I've never done a Dec. Daily either. I think the only minis I've ever done are vacation minis. If I did a Dec. album, though, I'd want it to look like this! Lots of pockets, coordinated papers, and quick and simple designs. Thanks for sharing your album on the hop! Thanks for the inspiration! Mini-albums intimidate me as well but I think I might give it a go this year. Simple Stories will hopefully make it easier! WOW!!! I love your album and this blog hop is amazing!!! That sequin heart made me SWOON! Delightful! I love this project! Thanks for the inspiration! Very cute album. Love it!